Made in the German knife-making center of Solingen, this stiletto-type pocket knife is functional as well as beautiful. Although it looks like an automatic, it's a slip joint with some interesting extra features. The blade shape of the 440A high carbon stainless steel gives the Medici the deadly look of a medieval dagger, and in use it even handles like one. If you open the Medici with the thumbnail notch and lock the blade, the knife works like a fixed blade and even has the parrying cross-guard of a fighting knife. For ordinary work, the cross-guard prevents slipping towards the cutting edge in wet or cold conditions. When the lockback lever is pressed, the blade and cross-guard rotate back toward the handle. While the blade fits between the liners, the cross-guard seats neatly against the bolster. For any sort of small cutting and piercing tasks, it's an excellent knife. Cross-guard, bolster, and pommel of polished brass accent the stainless steel blade and the handle slabs of natural stag antler. As with all Puma designs, each knife undergoes many hand operations, and the small differences in technique make every Puma handcrafted knife unique. Every pair of handle slabs is chosen for a close match in shape, but all show individual natural variation. The Puma Medici delivers stiletto style without the legal problems of automatic knives. Only four inches long when closed and packing a 2-3/4-inch-long blade, it may leave you wishing for more knife. 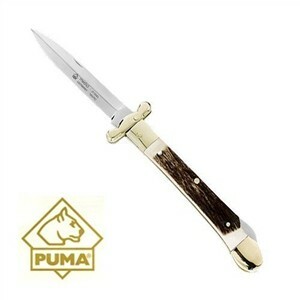 Although we'd like to see a larger version, it's a beautiful pocketknife and definitely another Puma to treasure. For a Puma knife made in a modified American style, see the Puma Stag Bowie Hunting Knife.